Habtoor City residences ... nearing completion. Construction of the three residential towers at Al Habtoor City in Dubai, UAE, is on track with more than 70 per cent of the project completed, according to the developer Al Habtoor Group. The three luxurious residential towers – Noora, Amna and Meera – form part of the Residence Collection of the development. The freehold property offers 1,427 luxury apartments set in the heart of Dubai on the banks of the Dubai Water Canal and on Sheikh Zayed Road. The Residence Collection is set in the heart of the one-million-sq-ft development. Housed within two 73-storey towers and one 52-storey tower, the homes comprise deluxe apartments, lofts and simplex, duplex and VIP penthouses, ranging from one to seven bedrooms. 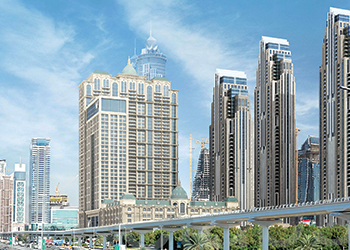 The residential community will have exclusive access to first-class amenities, which include the largest swimming pool and leisure deck in the UAE, a state-of-the-art gym, a luxury spa, multiple restaurants and bars, the Al Habtoor Tennis Academy – which includes an indoor tennis court for year-round play. The heart of the Leisure Collection features a permanent state-of-the-art, high-tech theatre housing the region’s first resident show - La Perle. Created by world-renowned artistic director Franco Dragone, La Perle combines the spirit of Dubai with a 1,300-seat aquatheatre and is the only permanent water-based theatre production between Las Vegas and Macau. Three five-star hotels within the Al Habtoor City’s Hotel Collection, The St Regis Dubai, W Dubai – Al Habtoor City, and The Westin Dubai, Al Habtoor City collectively present nearly 1,600 rooms and suites, 18 restaurants and lounges, two spas, 34 meeting and banqueting spaces, including three ballrooms.